This is an advertisement announcing the new Wang 500 calculator. The 500 series, which consisted of the base model 500, and the expanded model 520, with both machines offered with an optional integrated drum line printer, as well as an integrated compact cassette tape drive. 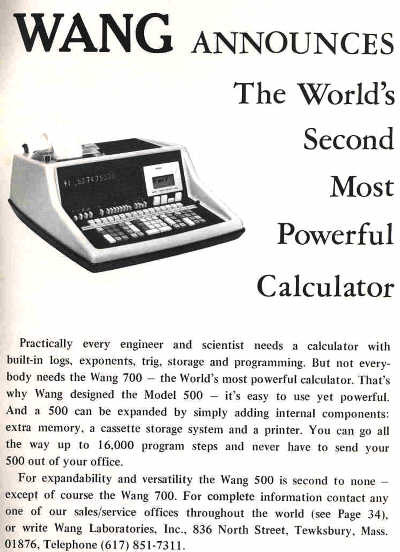 The 500-series was a reduced-capability version of Wang's "top gun" 700-series calculators, positioned to purposefully not impact the strong sales success of the 700-series, but providing a lower-cost entry point for what was still a rather powerful programmable desktop calculator. The Nixie tube display was reduced to a single register versus the 700's two register display, and the amount of storage available for memory registers and program steps was reduced from that of the 700-series machines. The 500-series returned to Wang's "two calculators in one" design, with a left and right math unit, similar to that used in Wang's 300-series calculators, but allowing all four math operations to be performed in each math unit versus just addition and subtraction as in the 300-series. This made the 500-series calculators easier to learn and program for those who were perhaps upgrading from a 300-series calculating system. The 500-series calculators still utilized Wang's rather unique wire-rope ROM for the calculator's operating microcode, but substituted new-technology Metal-Oxide Semiconductor (MOS) Random Access Memory (RAM) chips in place of the magentic ferrite core memory of the 700-series. The 500-series also had trigonometric functions built-into the microcode, while the 700-series had to have a trig program loaded into program memory in order to perform trig operatioons. The 500-series was formally introduced in January of 1971, and deliveries began in the spring of 1971.